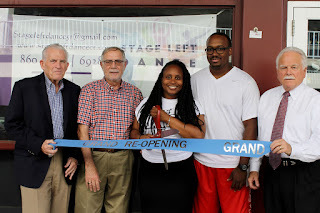 (Middletown, CT.) Chairman Gregory Shook of the Middlesex County Chamber of Commerce announced that a ribbon cutting was held for Stage Left Dance Studio located at 100 Riverview Center, Suite 100 in Middletown on Tuesday, July 26, 2016 at 4 p.m. Stage Left Dance teaches classes for students ranging from age two to adults. The offerings include a range of dance styles, from ballet and lyrical, to tap and hip-hop. “Leah Maille, Owner of Stage Left Dance is a fixture of the Middletown community who has been a part of the studio since it first opened as both a student and an instructor. We look forward to welcoming her officially to the business community as she teaches the next generation of dancers in her studio,” said Middlesex County Chamber of Commerce President Larry McHugh. Stage Left Dance will hold a Grand Reopening celebrating its 15 years of dance on August 6 from 11:30 a.m. to 4 p.m. The Grand Reopening will feature performances, food, and more. Free demonstration classes will also be offered on Aug. 6 with Hip-hop schedule from noon to 12:30 p.m., Lyrical/Ballet from 1 p.m. to 1:30 p.m., Tap from 2 p.m. to 2:30 p.m. and Jazz from 3 p.m. to 3:30 p.m.
For more information on Stage Left Dance visit www.stageleftdancect.com. *From left to right appears: President of Middlesex County Chamber of Commerce Larry McHugh, Middletown Deputy Mayor Bob Santangelo Owner and Director of Stage Left Dance Leah Maille, Kyle Lilly and Middletown Small Business Development Counselor Paul Dodge.